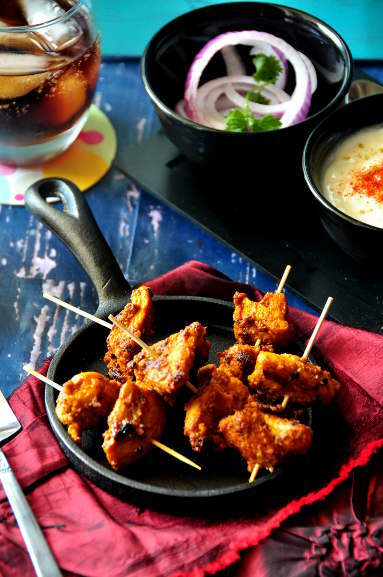 Chicken tikka is the quintessential appetizer in of all Indian restaurants all over the globe. Whether it’s a restaurant in Bangalore or in Belgium, chicken tikka will always be there in the menu. I have had my fair share of chicken tikka kebabs in restaurants all over the place. Most of them I found were either too dry or too bland. So, I tried experimenting on the best way to cook this oh-so-important appetizer. After a lot of tries with various store bought dry tikka masala, and failing almost every time, I took the matter pretty seriously. So, this time I made the masala paste from scratch. And, just to give it that oomph I added some Sriracha and carom seeds to it. Yes, you heard it right, I added the very Chinese sauce to this very Indian recipe, but the result was just fabulous. The heat of the Sriracha mixed with the carom seeds gave it a much better taste. Kebab is a very Middle Eastern dish, but like all other Middle Eastern recipes, kebabs also got included in the Indian menu as a part of Mughlai cuisine. Kebabs are generally cooked in open fires, in a charcoal grill. 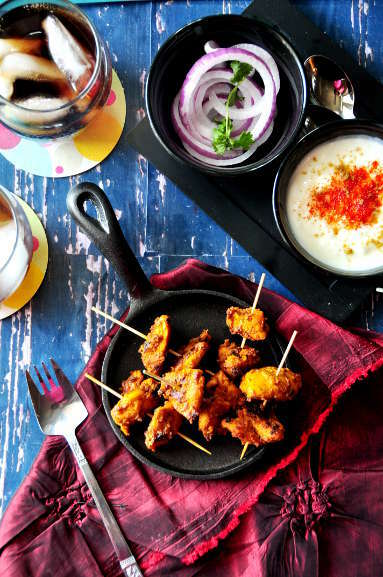 The charcoal gives it a smoky taste, and probably enhances the flavor (I have tried chicken tikka kebabs in stovetop, oven and charcoal grill; but the last one turned out to be the best). In a nonstick frying pan, heat the oil, add the onion paste and fry till the onion starts changing color, about 2 to 3 minutes. Add the green papaya, ginger garlic paste, and tomato paste. Fry till the oil starts to come out of the paste, about 3 minutes. Add all the dry powder and season with salt. This paste you can make ahead, and store in the fridge for upto 3 days. When you are ready to cook, take out the chicken and bring to normal temperature about an hour before. Heat a shallow pan and lightly grease with oil or cooking spray, lay down the chicken pieces on the pan, make sure all the pieces touch the bottom of the pan, if you have more chicken, then fry in batches. Cook each side for about 2 minutes or till the chicken is cooked through.